Debra Granik has been working and making films since 1987, but she’s far from a household name. Her most well-known work, “Winter’s Bone,” came out in 2010 and catapulted Jennifer Lawrence to stardom. Granik’s movies are often minimalist in story, quiet, and deal with harsh or depressing themes. “Leave No Trace” follows trends in Granik’s earlier work, as a story about a father and daughter who live in the woods in relative isolation. Thomasin Harcourt McKenzie as Tom and Ben Foster as Will. Bleeker Street ©️ 2018. The heart of “Leave No Trace” is rooted in the relationship between Tom and her father, Will. Will, who we eventually learn is a veteran, suffers from what is most likely PTSD and paranoia. He feels that he can’t function in the “normal” world, or maybe he doesn’t want to, while Tom starts to wonder if the world isn’t such a bad place afterall. Tom, played wonderfully by newcomer Thomasin Harcourt McKenzie, has had an exceptional childhood with her father. We never know how long Will and Tom have lived alone in the woods, but we assume it’s been quite some time. She seems to have an understanding of her circumstance and truly appreciates her home with her father even though she’s kept away from modern amenities. Tom and Will often chalk it up to being misunderstood, which has its merits, but their lives still have problems albeit unique ones. Granik and her co-writer Anne Rosellini, who adapted the story from the novel “My Abandonment” by Peter Rock, leave a lot of the story open to interpretation, which is part of what makes “Leave No Trace” so successful. There is little dialogue even between Will and Tom. They spend most of their time walking, surviving, and hiding. As the story progresses, 13-year-old Tom grows more frustrated with why she and her father live the way they do: perpetually on the move and cut-off from the world. Wise beyond her years, Tom begins to understand there are aspects of modern life she enjoys, and her father’s problems don’t have to be hers. It’s not cellphones or the internet but human connection that intrigues Tom. As close as she is with Will, there are certain needs that can’t be fulfilled by one’s parents or by just one person. Though Tom and Will have always been an inseparable, brilliant team, Tom’s interactions with others begin to peak her curiosity. 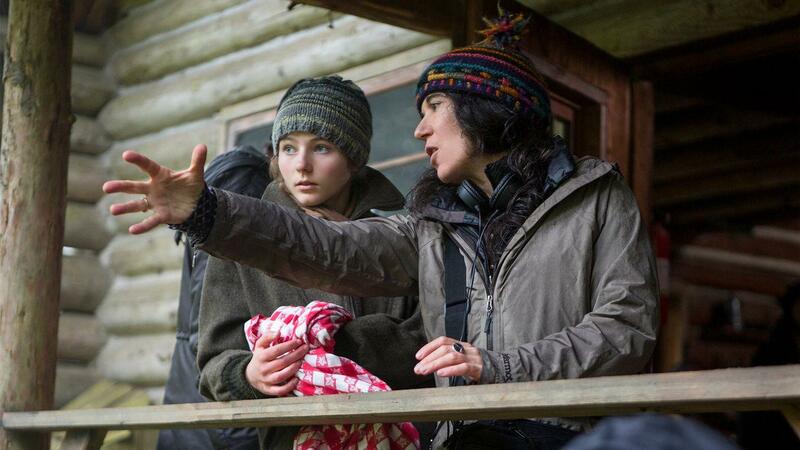 Thomasin Harcourt McKenzie receiving direction from Debra Granik. Bleeker Street ©️ 2018. Just as important as the acting and story are the images and cinematography of the film. 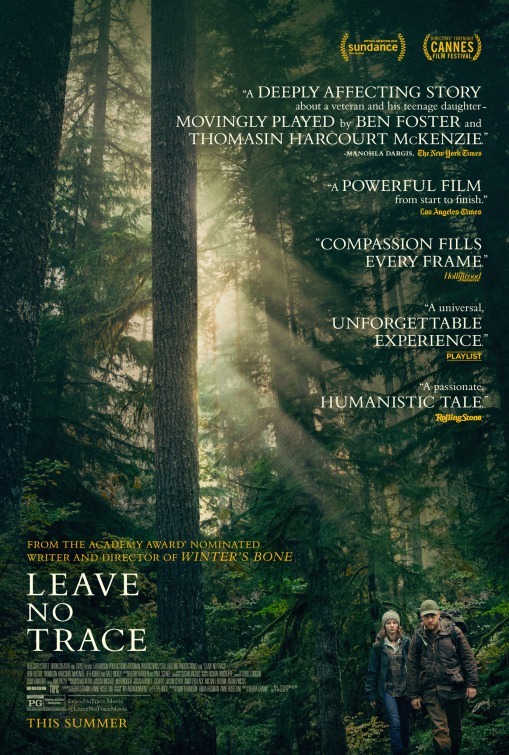 “Leave No Trace” takes place in Oregon and Washington and much of Will and Tom’s lives are spent in the forest of the Pacific Northwest. The landscapes are lush, and Granik’s camera is patient as it rests and allows viewers to take in the images. There are many uses of wide shots that allow the audience to understand how small we are in the grand scheme of things. As Tom and Will hike through the forests of Washington, we almost lose sight of them. Is that because Will wants to be unseen or because it’s so easy to become lost in undisturbed nature? Regardless of the reasons, Granik employs great use of the environmental surroundings. Even in the moments Tom and Will are out of the forests, we are always aware of their surroundings be it rolling hills or the city of Portland. Not only do the environments remind us of who Will and Tom are or who they are trying to be, but there are several occurrences where the film uses animals to reinforce the calming aspects of nature. Will, who is extremely troubled from his past life, is even comforted in one, silent scene by a horse in a stable. 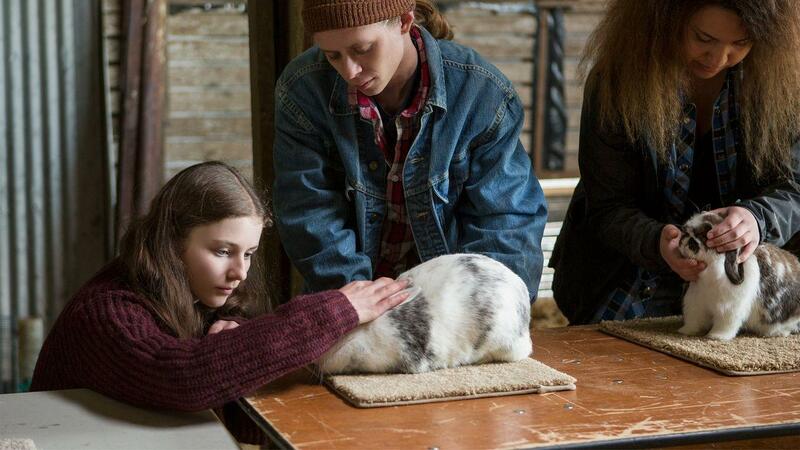 We see Tom meet another person her age who shows rabbits for 4H. Tom is fascinated with the rabbit and holds it for as long as she can, calmly stroking it. Toward the end of the film, a man provides a pseudo therapy dog to Will. Though there is no strong theme or meaning to these animals, they work in conjunction with Granik’s landscape. They remind us of the power and intelligence of the natural world. Tom and her friend Isaiah learning how to show rabbits. Bleeker Street ©️ 2018. I’ve recently gotten back into my movie groove. Of the more than 40 films from 2018 I’ve seen this year, “Leave No Trace” has been the most perfect. With so little going on, I felt so emotional and connected to the story and characters. Flooded with beautiful scenes and music that moved me to tears, Granik has succeeded in creating another minimalist masterpiece.